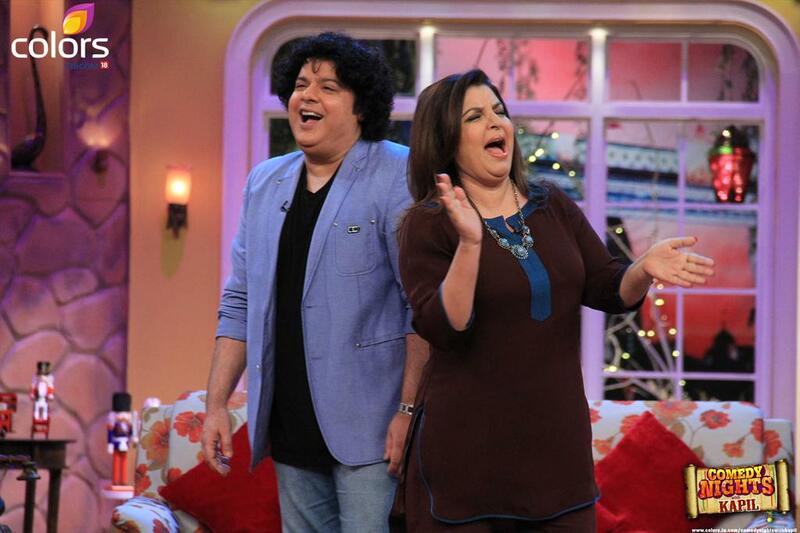 Sajid and Farah get warm welcome by Kapil. Farha takes Siddhu’s seat and pulls his leg and he counters her by saying of not giving up his seat and reminds her about his political background. Farha shares an anecdote of how Sajid took some girl as his sister to his school for three years and she came to know of it very late. A girl marks her entry (actor – Atul Parchure). Bittu asks Farah to teach dance to that girl. She tells Bittu on coming on his show for free and goes on to say that her movie has been a hit so why she should teach dance there. Bittu counters by saying that even his upcoming movie is going to be a hit and asks Sajid to teach the lady. On that note, Sajid reminds both Farah and Kapil that their films are already hit or going to be hit but his movie was badly hit invoking laughter. Later, Gutthi comes on the stage and gives her signature introduction while holding a gun directed at Sajid and Farah. Palak comes next and dances with Gutthi and speaks of bringing milk for Sajid as his Swayamvar [practice of choosing a husband by a girl] is going on there. Furthermore, Palak wants to speak the marriage matter with Sajid and Gutthi thinks she is speaking about her marriage. Gutthi makes it clear that no one can come between her and Sajid which makes Palak distraught. Bua comes next and dons the similar attire like Gutthi and also wants to participate in the Swamvyar. With two more girls in the get-up of Gutthi and even wants to follow her footsteps would certainly throw challenging situation to Sajid and also laughter. After a while, Farah decides the winner will be choosen by musical chair while Sajid is tied to a chair and Palak and Gutthi making rounds and sits on him when she stops the music. After ending that musical chair play, the guests leave the stage as Palak and Gutthi couldn’t control themselves and start fighting. Stay tuned to Comedy Nights on Colors. * Actor Atul Parchure portrayed the girl for whom Bittu asked Farah to teach dance. – Atul has worked in Bollywood movies – Khatta Meeta, All the Best: Fun Begins, and Kyon Ki and many more. – Currently working in the role of Chitragupt in Sab TV’s Yam Hai Hum and various characters in Comedy Nights. Image credit: Atul’s pic from his Wikipedia page.